Happy Labor Day! I'm glad the sun is back out -- at least for us here on the Cape. Hope it is for you, too! I'm just doing a little bit of work this morning and then I'm going to play for the rest of the day. It will likely be my last "play" day for a while! Of course I wanted to pop back in here today to share with you the next project in my Fall for Holiday Catalog Countdown! Today I'm playing with the Merry Little Christmas "mega" suite. It takes up two full pages in the new holiday catalog (pages 10-13). Specifically, I played with the Merry Little Labels bundle. Can you see the shine factor on the greeting? And how it progresses from the three colors: Lemon Lime Twist, Wild Wasabi and Old Olive? Okay... that's it for today. But I'll be back again tomorrow with another fun, fall project! I hope you'll come back to visit. If you'd like to order some of the goodies shown in this countdown, you can shop HERE. I do have a hostess code set up for this Countdown event, so if you could apply WK7DFWJ7 as the hostess code for your order at checkout I would really appreciate it! So, you know how I said 'send me the holiday catalog but I probably won't buy anything b/c I have a ton of supplies I don't use already'? Well... I just started a list to order... this set, punch, paper, ribbon & matching accessories!! Love learning new techniques! Pretty card! Jen, that ombre look on the tag is so cool! I like the ease of using the sponge daubers to get the three colors onto the stamp. Much more controlled than trying to put part of the stamp onto the ink pad. I always forget about embossing & how its adds ani e touch to a card. 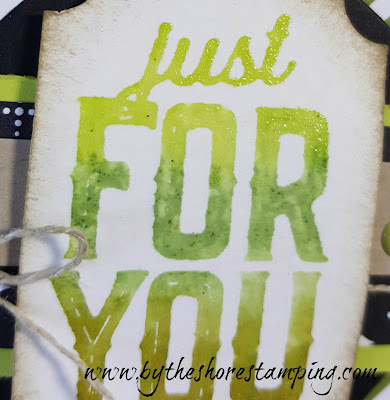 What a fun technique---I've never thought to heat emboss with water and powder over a watercolored image, that's very cool. That label bundle is on my wish list!! :) Thank you, Jen! I'm loving the merry little Christmas suite! I'm not usually a big fan of ombre, but it's growing on me and I love this technique! It gives a simple card just the right pop and the shine makes it eye catching!